I am experiencing interference from my microwave when I use my computer with home wifi. My router is a Netcomm one, supplied by Slingshot. I think it only supports 2.4GHz. It loads up the Netgear Genie on my computer when I turn it on and, using that Genie, I can locate and log onto the 2.4GHz extension network. 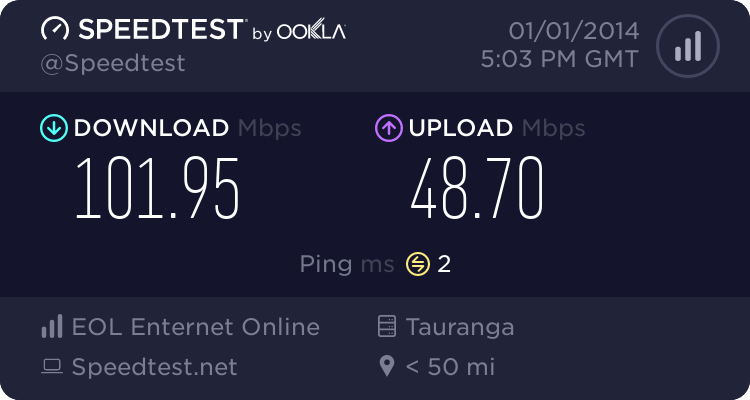 That helps quite a bit in terms of getting a stronger signal closer to my laptop., minimising the impact of the microwave. However, I was hoping that the extender would also produce a 5GHz extension network (by converting the original 2.4GHz signal), but I can't see any when I scan for networks. I just wonder if I was wrong to think that the repeater could convert the signal to 5GHz. Perhaps I need to buy a new router? The "repeater" can only repeat signals it receives, not convert them. Can you move your WiFi kit further away from the Microwave? However, I would probably be *more* worried about your microwave leaking radiation that badly. I'd get a new microwave ASAP. Surely you value your health more than your Internet? Dude, get a new microwave! Can you run an ethernet cable to the new extender? That way it might do 5GHz natively. Otherwise return it and get something that will do what you need. A microwave is around 30,000x more powerful than a wifi radio. All microwaves leak enough to disrupt wifi, especially if the signal is weak, or one end is close to the microwave. Check if its a single or dual radio extender. If its a dual one then it should be able to repeat the 2.4Ghz network on both 2.4 and 5Ghz, which will be useful if you put it outside the range of total anihalation of performance of the microwave. But only if the device can recieve 5Ghz wifi. Most cheap laptops still come with 2.4Ghz only cards in them because it would be about $20 more for them to fit dual band. Worse, many laptops have a whitelist of allowable wifi cards so that you cant just get any old dual band card and swap it over, you have to match it to the whitelist in the computer. hashbrown: A microwave is around 30,000x more powerful than a wifi radio. All microwaves leak enough to disrupt wifi, especially if the signal is weak, or one end is close to the microwave. Nope. Never had any issues with the Microwave at home and WiFi, the Microwave at Work and WiFi, or any of our clients and their WiFi and microwaves. Typical microwave = 1000W. Typical WiFi operating at maximum power, 100mw. 1000/.1 = 10,000 times more powerful. Either the WiFi is extremely close to the Microwave, or, more likely, the Microwave has a serious leakage issue. 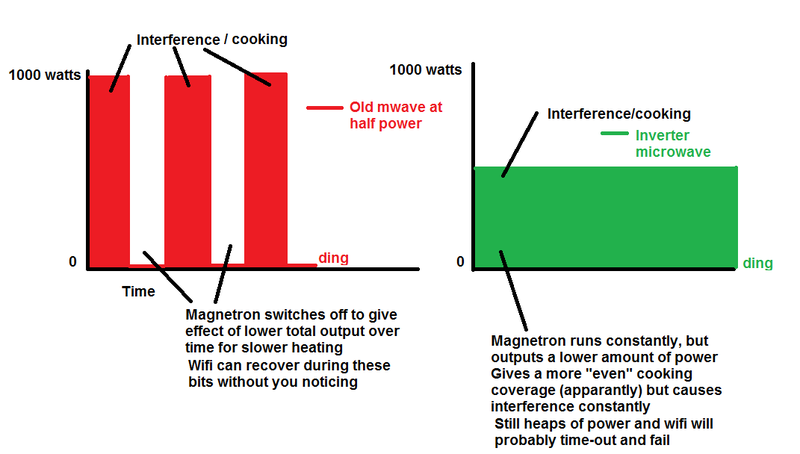 Most old microwaves power the magnetron from mains by a transformer so it pulses 100 times a second and there is plenty of idle time for wifi to happen with only a few 10s of ms of latency. New ones are powering them from a switching power supply, so its constant. Had no problems with the old LG crap one. New panasonic inverter one causes a bubble of no wifi working about 5m around it. Even me upstairs thru a floor that annialates wifi signals gets affected when its running. richms: Most old microwaves power the magnetron from mains by a transformer so it pulses 100 times a second and there is plenty of idle time for wifi to happen with only a few 10s of ms of latency. Isn't the national grid frequency about 50Hz, as in 50 cycles per second? Sure that equates to 100 charges in "direction" of the current, but I don't see the impact on the issue since the line supply gets feed into a step up transformer, which is then converted to "DC" before feeding the magnetron. Once it is converted to DC it really doesn't matter about the frequency and or many changes per second in the current. Also, 50Hz (or 0.00005Mhz) s a long long way away from the 2400Mhz or so that Microwave ovens operate around. I have a Panasonic inverter microwave about 12 months old. I just sat my laptop immediately next to. I started a speedtest and then microwaved some water. The speedtest was was not impacted. Not even slightly. If you are finding it 100% kills the signal within 5m and on the floor above I'd get it checked out. That is not normal. Especially since you have the same microwave as me. Typical microwave = 1000W. Typical WiFi operating at maximum power, 700mw. 1000/.7 = a bit under 1500 times more powerful. I'm not sure where you pulled 700mW from. Try 30mW. I was thinking of cell phones, which was wrong. I've corrected the post since then. You can go up to 100mw in the 2.4Ghz band. For an AP sure, but the client will probably be around 30mW and will need to at least get TCP ACKs back for anything it receives. If the client is at the margin of coverage and the AP and microwave are a few meters apart, I wouldn't freak and buy a new microwave if the wifi is affected. If you look at the output of a microwave as its interference on analog 2.4GHz video, there are 2 fat bars where is it powered and interfering with the 50Hz video, and 2 areas where it is basically clear. There isnt any conversion to DC other than a relativly small for the load capacitor on the high voltage side, certainly they dont smooth them to perfect DC in any of the old style cycling microwaves I have had. See pings go from 1ms on wifi to anywhere between 1 and 20 with the old microwave running, but they all still get there. New one just murders the band a few seconds after hitting start. There is a bit of confusion there. The magnetron zaps the food with microwaves at 2.4ghz. Many microwaves have a "power level" setting. If you set a 1000 watt microwave at power level 10, it will run the magnetron at 1000 watts for 10 seconds. If you set a 1000 watt microwave at power level 5, it will run the magnetron at 1000 watts for 5 seconds, then wait 5 seconds letting the food cool a little bit while it continues to rotate and the timer times, then start zapping again for another 5 seconds. During the non-inverter cooling periods, the wifi can probably recover, but an inverter running constantly will of course constantly interfere and therefore your wifi doesnt have time to recover. Older cordless phones, microwaves, video senders and other analog 2.4ghz equipment are all known to interfere with wifi - its common knowledge and is stupid to suggest otherwise. If you are having success with your microwave and wifi then its purely by luck - your microwave may be good at keeping radiation within itself, may be distant from your laptop or router or for thousands of other reasons. But it should not be said that microwaves don't interfere with wifi. The 50hz mains supply doesnt have anything to do with it though the on/off switching of a magnetron may be quite fast, but when the magnetron is running, it is transmitting waves at 2.4ghz in the direction of the food. With regards to the wifi - you need to get a second router that supports access point only mode (most belkins) and also supports 5ghz output. You then use an ethernet cable or powerline/homeplugs to connect it to your master router.